Miksang, at its most basic level, is concerned with uncovering the truth of pure perception. We see something vivid and penetrating, and in that moment we can express our perception without making anything up—nothing added, nothing missing…. One moment, one shot. Graceful Appearance. “Good” here doesn’t mean good as we usually use the word, as in good or bad. Good here means that our mind is uncluttered by preoccupation, relaxed and open. Its innate nature is clear, brilliant, and extremely precise…. The world becomes a magical display of vivid perception. We can develop the ability to experience and express these experiences precisely through the practice of contemplative photography. 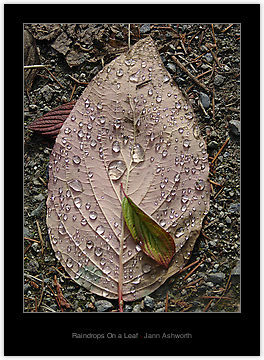 Here is a recent image by Jann Ashworth, whose work I am following on RedBubble. Thanks for the link to this Mike – so refreshing and rejuvenating. I love it. A great reminder to live in the moment. Thank you.